Sepphoris (/sɪˈfɔːrɪs/) or Zippori (/ˈzɪpəraɪ/; Hebrew: צִפּוֹרִי Tzipori; Ancient Greek: Σέπφωρις Sépphōris; Arabic: صفورية‎ Saffuriya), also called Diocaesaraea (Ancient Greek: Διοκαισάρεια) and, during the Crusades, Sephory (/ˈsɛfəri/; Old French: La Sephorie), is a village and an archeological site located in the central Galilee region of Israel, 6 kilometers (3.7 mi) north-northwest of Nazareth. It lies 286 m above sea level and overlooks the Beit Netofa Valley. The site holds a rich and diverse historical and architectural legacy that includes Hellenistic, Jewish, Roman, Byzantine, Islamic, Crusader, Arabic and Ottoman influences. In Late Antiquity, it was believed to be the birthplace of Mary, mother of Jesus, and the village where Saints Anna and Joachim are often said to have resided, where today a 5th-century basilica is excavated at the site honoring the birth of Mary. Notable structures at the site include a Roman theater, two early Christian churches, a Crusader fort renovated by Zahir al-Umar in the 18th century, and over sixty different mosaics dating from the third to the sixth century CE. Following the Bar Kokhba revolt of 132–135, Sepphoris was one of the centers in Galilee where rabbinical families from Judea relocated. Remains of a synagogue dated to the first half of the fifth century were discovered on the northern side of town. In the 7th century, the town was conquered by the Arab Rashidun armies during the Muslim conquest of the Levant. Successive Arab and imperial authorities ruled the area until the Crusades. A map of ancient Galilee.The Historical Atlas by William Shepherd, circa 1923. Archaeological remains from the Middle Paleolithic (including flints made with the Levallois technique) and the Yarmukian culture have been found. Remains have also been found from the Pre-Pottery Neolithic B and the Middle Chalcolithic era. According to the Mishnah, the old castle of Sepphoris was encompassed by a wall before the Israelite conquest of Canaan under Joshua. Evidence from ceramic remains indicates the site of Sepphoris was inhabited during the Iron Age, 1,000-586 BCE. Actual occupation and building work can be verified from the 4th century BCE, with the Hellenistic period. The Bible makes no mention of the city, although in Jewish tradition it is thought to be the city Kitron mentioned in the Book of Judges (1:30). 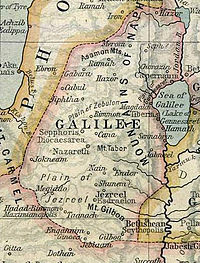 In 104 BCE, the Judean priestly dynasty of the Hasmoneans conquered Galilee under the leadership of either Alexander Jannaeus or Aristobulus I and at this time the town may have been administered by a quarter-master, probably Jewish, and by the middle of the 1st century BCE, after the campaigns of Pompey, it fell under Roman rule in 63 BCE and became one of the five synods of Roman influence in the Near East. The Roman client king, Herod the Great recaptured the city in 37 BCE after it had been garrisoned by the Parthian proxy, the Hasmonean Antigonus II Mattathias. The city was called Sepphoris from the word tzippori, a variant of the Hebrew word for bird, tzippor, perhaps, as a Talmudic gloss suggests, because it is "perched on the top of a mountain, like a bird". After Herod's death in 4 BCE, a rebel named Judas, son of a local bandit, Ezekias, attacked Sepphoris, then the administrative center of the Galilee, and, sacking its treasury and weapons, armed his followers in a revolt against Herodian rule. The Roman Governor in Syria, Varus is reported by Josephus - perhaps in an exaggeration, since archaeology has failed to verify traces of the conflagration - to have burnt the city down, and sold its inhabitants into slavery. After Herod's son, Herod Antipas was made tetrarch, or governor, he proclaimed the city's new name to be Autocratoris, and rebuilt it as the "Ornament of the Galilee" (Josephus, Ant. 18.27). An ancient route linking Sepphoris to Legio, and further south to Samaria-Sebastia, is believed to have been paved by the Romans around this time. The new population was loyal to Rome. Maurice Casey writes that, although Sepphoris during the early first century was "a very Jewish city", some of the people there did speak ancient Greek. A lead weight dated to the first century bears an inscription in Greek with three Jewish names. Several scholars have suggested that Jesus, while working as a craftsman in Nazareth, may have travelled to Sepphoris for work purposes, possibly with his father and brothers. Casey states that this is entirely possible, but is likewise impossible to historically verify. Jesus does not seem to have visited Sepphoris during his public ministry and none of the sayings recorded in the Synoptic Gospels mention it. The inhabitants of Sepphoris did not join the Great Jewish Revolt against Roman rule of 66 CE. The Roman legate in Syria, Cestius Gallus, killed some 2,000 "brigands and rebels" in the area. The Jerusalemite Josephus, a son of Jerusalem's priestly elite had been sent north to recruit the Galilee into the rebellion's fold, but was only partially successful. He made two attempts to capture Sepphoris, but failed to conquer it, the first time because of fierce resistance, the second because a garrison came to assist in the city's defence. Around the time of the rebellion Sepphoris had a Roman theater - in later periods, bath-houses and mosaic floors depicting human figures. Sepphoris and Jerusalem may be seen to symbolize a cultural divide between those that sought to avoid any contact with the surrounding Roman culture and those who within limits, were prepared to adopt aspects of that culture. Rejected by Sepphoris and forced to camp outside the city Josephus went on to Jotapata, which did seem interested in the rebellion, - the Siege of Yodfat ended on July 20 67 CE. Towns and villages that did not rebel were spared and in Galilee they were the majority. Coins minted in the city at the time of the Great Revolt carried the inscription Neronias and Eirenopolis, "City of Peace". After the revolt, coins bore depictions of laurel wreaths, palm trees, caduceuses and ears of barley, which appear on Jewish coinage albeit not exclusively. Just prior to the Bar Kokhba revolt, the city's name was changed to Diocaesarea in Hadrian's time, in honor of Zeus and the Roman emperor. Following the revolt in 132–135, many Jewish refugees from devastated Judea settled there, turning it into a center of Jewish religious and spiritual life. 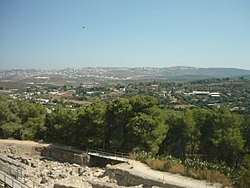 Rabbi Yehuda Hanasi, the compiler of the Mishnah, a commentary on the Torah, moved to Sepphoris, along with the Sanhedrin, the highest Jewish religious court. Before moving to Tiberias by 150, some Jewish academies of learning, yeshivot, were also based there. The Galilee was predominantly populated by Jews from the end of the 2nd century to the 4th century CE. As late as the third-fourth centuries, Sepphoris is believed to have been settled by one of the twenty-four priestly courses, Jedayah by name, a course mentioned in relation to the town itself in both the Jerusalem Talmud (Taanit 4:5) and in the Caesarea Inscription. Others, however, cast doubt about Sepphoris ever being under a "priestly oligarchy" by the third century, and that it may simply reflect a misreading of Talmudic sources. Aside from being a center of spiritual and religious studies, it developed into a busy metropolis for commerce due to its proximity to important trade routes through Galilee. Hellenistic and Jewish influences seemed blended together in daily town life while each group, Jewish, pagan and Christian, maintained its distinct identity. In the aftermath of the Jewish revolt against Constantius Gallus of 351-352, Diocaesarea, the epicenter of the revolt, was razed. Diocaesarea was further affected by the Galilee earthquake of 363, but rebuilt soon afterwards, and retained its importance in the greater Jewish community of the Galilee, both socially, commercially, and spiritually. The town was also the centre of a Christian bishopric. Three of its early bishops are known by name: Dorotheus (mentioned in 451), Marcellinus (mentioned in 518), and Cyriacus (mentioned in 536). As a diocese that is no longer residential, it is listed in the Annuario Pontificio among titular sees. In the centuries between the rule of Herod Antipas and the end of the Byzantine era, (7th century), the city reportedly thrived as a center of learning, with a diverse, multiethnic and mutlireligious population of some 30,000 living in relatively peaceful coexistence. Ya'qubi noted that Saffuriyyah was taken during the first conquest by the Arab armies in Palestine, in 634. Later, the city was incorporated into the expanding Umayyad Caliphate, and al-jund coins were minted by the new rulers. A stone built aqueduct dating to the early Umayyad period (7th century CE) has been excavated. Saffuriya was engaged in trade with other parts of the empire at the time; for example, cloaks made in Saffuriyya were worn by people in Medina. Umayyad rule was replaced by Abbasid rule, and Arab and Islamic dynasties continued to control the city, with a brief interlude during the Crusades, up until World War I. Throughout this period of time, the city was known by the Semitic name Saffuriya. The late 11th century the Crusaders invaded the region and shortly established the Crusader states, with Kingdom of Jerusalem nominally replacing the Islamic rule of Saffuriya. During this period, control changed over Saffuriya several times. 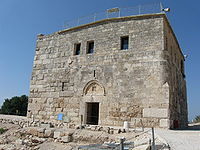 The Crusaders built a fort and watchtower atop the hill, overlooking Saffuriya, and a church dedicated to Anne, the putative mother of the Virgin Mary. This became one of their local bases in the Kingdom of Jerusalem and they called the city Sephory (Old French: La Sephorie). In 1187, the field army of the Latin Kingdom marched from their well-watered camp at Sephory to be cut off and destroyed at the Battle of Hattin. After the defeat of the Crusaders by Saladin, the Ayyubid Sultan renamed the city Saffuriya. In 1255, the village (castle) was back in Crusader hands, as a document from that year showed it belonged to the archbishop of Nazareth, but by 1259, the Bishop experienced unrest among the local Muslim farmers. Saffuriyyah was captured between 1263 and 1266 by Mamluk Sultan Baybars. Saffuriya (Arabic: صفورية‎, also transliterated Safurriya and Suffurriye), came under the rule of the Ottoman Empire after it defeated the Mamluks at the Battle of Marj Dabiq in 1516. An Ottoman firman of 1572 describes Saffuriyya as one of a group of villages within the sanjak of Safad, which was part of the Qaysi faction, and that had rebelled against the Ottoman authorities. In 1596, the population was recorded as consisting of 366 families and 34 bachelors, all Muslim. Saffuriyya was larger than neighboring Nazareth but smaller than Kafr Kanna. The villagers paid a fixed tax rate of 25% on various agricultural products, including wheat, barley, olive trees, goats and beehives, in addition to a press for olive oil or grape syrup and "occasional revenues"; a total of 31,244 akçe. 3/24 of the revenuer went to a Waqf. A number of important scholars came from the village during this period, including the qadi, al-Baq'a al-Saffuri (died 1625) and Ahmad al-Sharif (died 1633), a poet and qadi. It is reported that in 1745 Zahir al-Umar, who grew up in the town, built a fort on the hilltop above Saffuriya. A map from Napoleon's invasion of 1799 by Pierre Jacotin showed the place, named as Safoureh. In the early 19th century, the British traveller J. Buckingham noted that all the inhabitants of Saffuriya were Muslim, and that the house of St. Anna had been completely demolished. In the late 19th century, Saffuriyya was described as village built of stone and mud, situated along the slope of a hill. The village contained the remains of the Church of St. Anna and a square tower, said to have been built in the mid-18th century. The village had an estimated 2,500 residents, who cultivated 150 faddans (1 faddan = 100-250 dunams), on some of this land they had planted olive trees. A population list from about 1887 showed that Sepphoris had about 2,940 inhabitants; all Muslims. In 1900, an elementary school for boys was founded, and later, a school for girls. Though it lost its centrality and importance as a cultural center under the Ottomans (1517–1918) and the British Mandate (1918–1948), the village thrived agriculturally. Saffuriyya's pomegranates, olives and wheat were famous throughout the Galilee. According to the British Mandate's 1922 census of Palestine, Saffuriyeh had 2,582 inhabitants; 2,574 Muslims and 8 Christians, where the Christians were all Roman Catholics. By the 1931 census the population had increased to 3,147; 3,136 Muslims and 11 Christians, in a total of 747 houses. 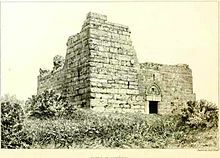 In summer of 1931, archaeologist Leroy Waterman began the first excavations at Saffuriya, digging up part of the school playground, formerly the site of the Crusader fort. A local council was established in 1923. The expenditure of the council grew from 74 Palestine pound in 1929 to 1,217 in 1944. In the 1945 statistics, the population was 4,330; 4,320 Muslims and 10 Christians, and the total land area was 55,378 dunams. In 1944/45 a total of 21,841 dunams of village land was used for cereals, 5,310 dunams were irrigated or used for orchards, mostly olive trees, while 102 dunams were classified as built-up land. By 1948, Saffuriya was the largest village in the Galilee both by land size and population. The Arab village had a history of anti-Yishuv activities and supported the Arab Liberation Army during the 1948 Arab–Israeli War. On 1 July 1948, the village was bombarded by Israeli aircraft. On 16 July it was captured by Israeli forces along with the rest of the lower Galilee in Operation Dekel. The villagers put up some resistance and managed to destroy several armoured cars in an ambush. Following the collapse of the resistance, all but 80 of the villagers fled. Some made their way northwards toward Lebanon, finally settling in the refugee camps of Ain al-Hilweh and Shatila and the adjacent Sabra neighborhood in Lebanon. Others fled south to Nazareth and the surrounding countryside. After the attack, the villagers returned but were evicted again in September 1948. On 7 January 1949, 14 residents were deported and the remaining 550 were resettled in neighboring Arab villages such as 'Illut. Many settled in Nazareth in a quarter now known as the al-Safafira quarter because of the large number of Saffuriyya natives living there. As the Israeli government considers them absentees, they cannot go back to their old homes and have no legal recourse to recover them. The works of the poet Taha Muhammad Ali, a native of Saffuriyya expelled from the town, and their relationship to the landscape of Saffuriya before 1948 are the subject of Adina Hoffman's My Happiness Bears No Relation to Happiness (Yale University Press, 2009). The area remained under martial law until the general lifting of martial law in Israel in 1966. Most of the remains of Saffuriya were removed in a late-1960s program to clear depopulated Arab villages. The site of the Arab village was planted with pine trees. By 2011, five books about the Palestinian village history had been published. On 20 February 1949, the Israeli moshav of Tzippori was founded southeast of the older village. The pomegranate and olive trees were replaced with crops for cattle fodder. The Crusade fortress on the hill overlooking the Roman theater was built in the 12th century on the foundation of an earlier Byzantine structure. The fortress is a large square structure, 15m x15m, and approximately 10 m. high. The lower portion of the building consists of reused antique spolia, including a sarcophagus with decorative carvings. The upper part of the structure and the doorway were added by Zahir al-Umar in the 18th century. Noticeable features from the rebuilding are the rounded corners which are similar to those constructed under Zahir in the fort in Shefa-'Amr. The upper part of the building was used as a school during the reign of Abdul Hamid II in the early 1900s (late Ottoman era), and used for this purpose until 1948. Much of the town has been excavated, revealing Jewish homes along a main cobblestone street. Several images have been found carved into the stones of the street, including that of a menorah, and another image that resembles some ancient game reminiscent of tic-tac-toe. Mikva'ot, Jewish ritual baths, identified by carved steps leading to a pool, were also discovered. The Roman theater sits on the northern slope of the hill, and is about 45 m in diameter, seating 4500. Most of it is carved into the hillside, but some parts are supported by separate stone pillars. The theater shows evidence of ancient damage, possibly from the earthquake in 363. A modern structure stands to one side of the excavations, overlooking the remains of a 5th-century public building with a large and intricate mosaic floor. Some believe the room was used for festival rituals involving a celebration of water, and possibly covering the floor in water. Drainage channels have been found in the floor, and the majority of the mosaic seems devoted to measuring the floods of the Nile, and celebrations of those floods. Revelers and attendants of the Dionysus party. A Roman villa on the site, built around the year 200, contains an elaborate mosaic tile floor in what is believed to have been a triclinium. In Roman tradition, seating would have been arranged in a U-shape around the mosaic for guests to recline as they ate, drank and socialized. The mosaic features images of Dionysus, god of wine and of socializing, along with Pan and Hercules in several of the 15 panels. The most famous image is that of a young woman, possibly Venus, which has been dubbed the "Mona Lisa of the Galilee". 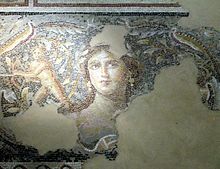 Smaller mosaic tesserae were used, which allowed for greater detail and a more lifelike result, as seen in the shading and blush of her cheeks. 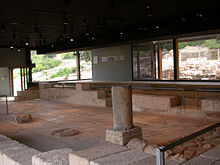 The remains of an ancient synagogue, Zippori Synagogue, have been uncovered in the lower section of the city. Measuring 20.7 meters by 8 meters wide, it was located at the edge of the town. The mosaic floor is divided into seven parts. Near the entrance is a scene showing the angels visiting Sarah. The next section shows the binding of Isaac. There is a large Zodiac with the names of the months written in Hebrew. Helios sits in the middle, in his sun chariot. The last section shows two lions flanking a wreath, their paws resting on the head of an ox. The mosaic shows the "tamid" sacrifice, the showbread, and the basket of first fruits form the Temple in Jerusalem. Also shown are a building facade, probably representing the Temple, incense shovels, shofars, and the seven-branched menorah from the Temple. Another section shows Aaron dressed in priestly robes preparing to offer sacrifices of oil, flour, a bull and a lamb. An Aramaic inscription reads "May he be remembered for good Yudan son of Isaac the Priest and Paragri his daughter Amen Amen"
Since 1990 large areas of Zippori have been excavated by an archaeogical team working on behalf of the Hebrew University's Institute of Archaeology. 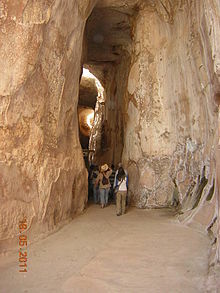 The remains of the ancient city are now a national park named Tzippori National Park. The site has many mosaics including, the ‘Mona Lisa of the Galilee’, also a depiction of a wine-drinking contest between Dionysus and Heracles. In 2012, a survey of the site was conducted by Zidan Omar on behalf of the Israel Antiquities Authority (IAA). In June 2018, archaeologists discovered two subterranean Byzantine period wine presses at Tzippori National Park. ^ Carpenter, William (1836). "Nazareth". The Biblical Companion; or, An Introduction to the Reading and Study of the Holy Scripture. London: Thomas Tegg & Son. p. 515. ^ Nicholson, Helen; Nicolle, David (26 September 2006). God's Warriors: Knights Templar, Saracens and the Battle for Jerusalem. U.S.A.: Bloomsbury U.S.A. p. 2006. ISBN 9781846031434. ^ a b Leroy Waterman (1931). "Sepphoris, Israel". The Kelsey Online. Archived from the original on 27 June 2006. ^ Zeev Weiss, 'The Mosaics of the Nile Festival Building at Sepphoris and the legacy of the Antiochene Tradition', in Katrin Kogman-Appel, Mati Meyer,(eds.) Between Judaism and Christianity: Art Historical Essays in Honor of Elisheva (Elizabeth) Revel-Neher, BRILL, 2009 pp. 9-24, p. 10. ^ Mariam Shahin (2005). Palestine: A Guide. Interlink Books: Northampton, Massachusetts. ^ Alysia Fischer, Hot Pursuit: Integrating Anthropology in Search of Ancient Glass-blowers, Lexington Books 2008, p. 40. ^ Richard R. Losch, The Uttermost Part of the Earth: A Guide to Places in the Bible, William B. Eerdmans, 2005 p. ix, 209. ^ Eric M. Meyers,'Sepphoris on the Eve of the Great Revolt (67-68 C.E. ): Archaeology and Josephus,' in Eric M. Meyers,Galilee Through the Centuries: Confluence of Cultures, Eisenbrauns, 1999 pp.109ff., pp.113-114. (Josephus, Antiquities of the Jews, 14.414-6). ^ Ariel Lewin, The Archaeology of Ancient Judea and Palestine, Getty Publications, 2005 p. 80. ^ Steve Mason (ed.) Flavius Josephus: Translation and Commentary. Judean war. Vol. 1B. 2,BRILL 2008 p. 1. Cf. Bavli, Megillah, 6, 81. ^ a b Eric M. Meyers,'Sepphoris on the Eve of the Great Revolt (67-68 C.E. ): Archaeology and Josephus,' in Eric M. Meyers,Galilee Through the Centuries: Confluence of Cultures, Eisenbrauns, 1999 pp.109ff., p. 114:(Josephus, Ant. 17.271-87; War 2.56-69). ^ a b c d e f g Casey, Maurice (2010). Jesus of Nazareth: An Independent Historian's Account of His Life and Teaching. New York City, New York and London, England: T & T Clark. pp. 163, 166–167. ISBN 978-0-567-64517-3. ^ Steve Mason (ed.) Flavius Josephus: Translation and Commentary. Judean war. Vol. 1B. 2,BRILL 2008 p. 138. The meaning of 'autocrator' is not clear, and may denote either autonomy or reference to a Roman emperor. ^ Craig A. Evans (ed. ), The Routledge Encyclopedia of the Historical Jesus, Routledge (2010),2014 pp.37,296. ^ Herbermann, Charles, ed. (1913). "Diocaesarea". Catholic Encyclopedia. New York: Robert Appleton Company. ^ Mordecai Avian, 'Distribution Maps of Archaeological data from the Galilee, in Jürgen Zangenberg, Harold W. Attridge, Dale B. Martin,(eds.) Religion, Ethnicity, and Identity in Ancient Galilee Mohr Siebeck 2007 pp. 115-132, p. 132. ^ Stuart S. Miller, 'Priests, Purities, and the Jews of Galilee,' in Jürgen Zangenberg, Harold W. Attridge, Dale B. Martin, (eds.) Religion, Ethnicity, and Identity in Ancient Galilee Mohr Siebeck 2007 pp. 375-401, pp.379-382. ^ Jürgen Zangenberg, Harold W. Attridge, Dale B. Martin, (eds.) Religion, Ethnicity, and Identity in Ancientr Galilee Mohr Siebeck 2007 pp.9, 438. ^ Bernard Lazare and Robert Wistrich, Antisemitism: Its History and Causes, University of Nebraska Press, 1995, ISBN 080327954X. ^ "Israel Seismic Activity Since The Times Of Jesus". The Urantia Book Fellowship. Retrieved 14 December 2015. ^ Knight, Kevin. "Diocaesarea". Catholic Encyclopedia. Kevin Knight. Retrieved 14 December 2015. ^ Kathryn M. Duda (1998). "Interpreting an Ancient Mosaic". Carnegie Magazine Online. Archived from the original on 14 April 2006. ^ a b c d e f Khalidi, 1992, p. 351. 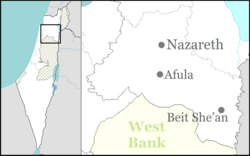 ^ Pappe, Illan (2010) The Rise and Fall of a Palestinian Dynasty. The Husaynis 1700-1968. Saqi, ISBN 978-0-86356-460-4. p. 35. ^ Conder and Kitchener, 1881, SWP I, pp. 279 -280. Quoted in Khalidi, 1992, p. 351. ^ a b Laurie King-Irani (November 2000). "Land, Identity and the Limits of Resistance in the Galilee". Middle East Report. No. 216 (216): 40–44. doi:10.2307/1520216. JSTOR 1520216. ^ O'Ballance, Edgar (1956) The Arab-Israeli War. 1948. Faber & Faber, London. p. 157. ^ Aron Shai (2006). "The fate of abandoned Arab villages in Israel, 1965–1969". History & Memory. 18 (2): 86–106. doi:10.2979/his.2006.18.2.86. ^ Bar-Am, Aviva (25 January 2010). "Ancient Tzipori". Jerusalem Post. Aubin, Melissa M. (2000). The Changing Landscape of Byzantine Sepphoris (PDF). ASOR Publications. Archived from the original (PDF) on 23 June 2003. Barzilai, Omry (18 November 2010). "'En Zippori" (122). Hadashot Arkheologiyot – Excavations and Surveys in Israel. Benveniśtî, M. (2002). Sacred landscape: the buried history of the Holy Land since 1948 (Illustrated ed.). University of California Press. ISBN 9780520234222. Berger, Uri; Barzilai, Omry (28 December 2013). "Nahal Zippori 23" (125). Hadashot Arkheologiyot – Excavations and Surveys in Israel. Chancey, Mark A. (2005). Greco-Roman culture and the Galilee of Jesus (Illustrated ed.). Cambridge University Press. ISBN 9780521846479. Cohen, S.J.D. (2002). Josephus in Galilee and Rome: His Vita and Development As a Historian. BRILL. ISBN 978-0391041585. Crone, P. (2004). Meccan trade and the rise of Islam. Gorgias Press. ISBN 9781593331023. Guérin, V, (1880). Description Géographique Historique et Archéologique de la Palestine (in French). 3: Galilee, pt. 1. Paris: L'Imprimerie Nationale. (IIED), International Institute for Environment & Development (1994). Evictions - 7010iied. IIED. ISBN 9781843690825. Kacowicz, Arie Marcelo; Lutomski, Pawel (2007). Population resettlement in international conflicts: a comparative study (Illustrated ed.). Lexington Books. ISBN 9780739116074. Khalidi, W. (1992). All That Remains: The Palestinian Villages Occupied and Depopulated by Israel in 1948. Washington D.C.: Institute for Palestine Studies. ISBN 978-0-88728-224-9. Miller, Stuart S. (1984). Studies in the History and Traditions of Sepphoris. BRILL. ISBN 978-9004069268. Porat, Leea (8 May 2005). "El-En Zippori" (117). Hadashot Arkheologiyot – Excavations and Surveys in Israel. Richardson, Peter (1996). Herod: king of the Jews and friend of the Romans (Illustrated ed.). University of South Carolina Press. ISBN 9781570031366. Rowan, Yorke M.; Baram, U. (2004). Marketing heritage: archaeology and the consumption of the past (Illustrated ed.). Rowman Altamira. ISBN 9780759103429. Wikivoyage has a travel guide for Zippori.